What would become NBC12 signed on the air on Sunday, April 29, 1956. At the time it was WRVA-TV and it was a CBS affiliate. Over the years that followed, the station was affiliated with CBS, ABC and finally NBC. Our history, and that of television in Richmond, is a story complete with corporate intrigue and government policy changes. One of the men who lived it, wrote it all down shortly before his death. "Roots to Satellites" is a history of TV in Richmond by Sanford Terry, the man who built what is now WWBT. From the corporate foot dragging that left WRVA third in the race, to the executive who felt the station should be built along the design of his "cow barn," it's a story we hope even non-broadcasters will find fun to read. We're pleased to be able to provide Mr. Terry's "Roots to Satellites" online. Richmond's AM radio stations WRVA and WRNL rode the crest of an unprecedented wave of prosperity in 1945 and 1946. Their owners were in no hurry to join the pioneer trek to television, influenced no doubt by thoughts of large and risky capital. In early 1945, just months before the war ended, the FCC allocated four VHF TV channels to Richmond. 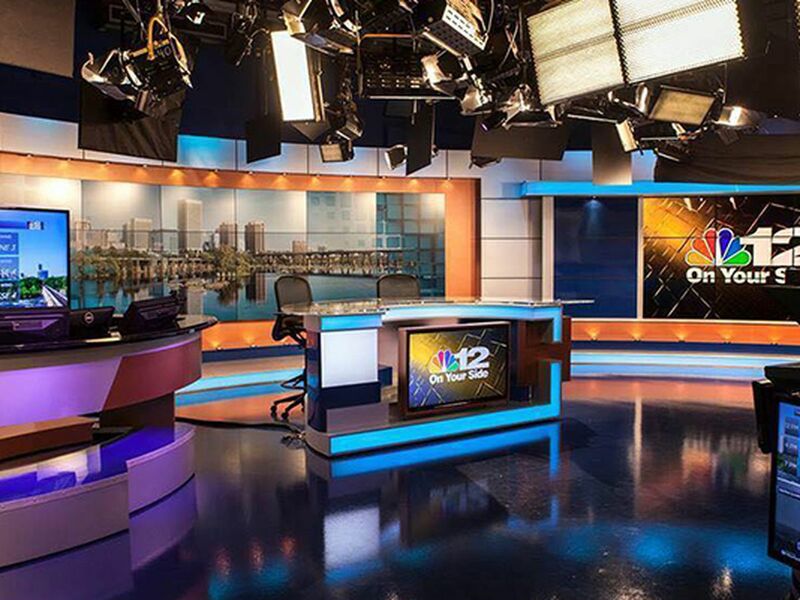 Local observers mistakenly guessed that the franchises would be quickly picked up by WRVA and WRNL, regarded in the industry as Virginia's leading broadcasters. The third and fourth channels were wild cards. Another local radio station, WMBG (now WTVR-AM), was not thought of as a likely contender, but its owner, the founder of the future WTVR, took the initiative and picked up a channel before an unexpected construction permit freeze was imposed. WTVR (and WBTV, Charlotte) were among the 108 pre-freeze stations. Foot dragging was costly for others. In the end, WRNL lost its television bid and WRVA got only a half loaf. The WTVR story is a genuine rags to riches saga of a $500 investment that brought millions when the property was sold. Wilbur M. Havens and a man named Martin owned a hole-in-the-wall automobile battery and ignition shop on West Broad near Laurel street. In 1927, the partners, drawn by the romance of radio, obtained a license (WMBG) to operate a ten watt station on the second floor of the shop. Power was stepped up several times. By 1939, growing WMBG sported a new 5000 watt transmitter on Staples Mill Road and a studio and office building at 3301 West Broad. Martin sold his share of the business to Havens in 1942. Having no board of directors or partners to answer to, Havens could move as he desired. In 1947, he brought the first FM service to Richmond. His WCOD(FM) operates now as WTVR-FM. It is unknown if Havens at the time saw a golden future for television. Possibly he was drawn to the romance of TV just as he had been to radio 20 years earlier. Whatever the motivation, Havens kept his dream of television to himself until papers were filed with the FCC. With no other Richmond applications to consider, the commission quickly granted his request for authority to build a station on Channel six. A sync generator and the control room switcher were said to have been built in the chief engineer's home workshop. FM and TV antennas shared space on a fairly short tower adjacent to the AM towers on Staples Mill Road. An addition to the transmitter building housed a medium power FM and five hundred watt TV transmitter. And a small studio and control room went into the West Broad Street radio building. Havens' WTVR won the everlasting distinction on April 22, 1948, of being the first television station south of Washington, DC to begin broadcasting. The owners of WRVA and WRNL were jolted into action and both companies quickly applied for permits. They were too late. A growing backlog of applications had swamped the commission and the Richmond cases were still pending when the FCC processing line was abruptly stopped. Richmond was to remain a one station town until 1956. Although WTVR was an NBC affiliate, contracts to single station markets were non-exclusive, allowing Havens to book CBS and ABC offerings if he cared to do so. For eight years, viewers in Central Virginia either watched WTVR, or by placing antennas on tall poles, could tune in snowy images coming in from Washington or Norfolk. Most set owners elected to keep dials locked on channel 6 and their antennas oriented toward West Broad Street. Owners of Larus and Brothers Tobacco Company and its powerful WRVA subsidiary had a lofty objective. Their future Television station was to be a giant in Central Virginia, rivaling 50,000 watt WRVA in size and importance. During the years of stalled FCC hearings a New Jersey consulting firm was employed to study potential tower sites. The best location to cover Central Virginia, the consultant said, was near U.S. Route 250 at Oilville, 25 miles west of the City center. The concept of placing a TV tower miles from the city was faulty, however. Although regional coverage would be better, the target city would receive a signal of inadequate strength. A location on Parham Road on the land now occupied by Regency Square fitted engineering standards, but Henrico County zoning authorities were unwilling to allow construction of a tall tower close to prime residential areas. The land eventually chosen was near the intersection of Midlothian Turnpike and German School Road, then a rural district outside the city. Richmond did not extend its boundaries to include the site until the early 1960's. In anticipation of eventually moving into television, Richmond Newspapers, Inc. (WRNL) opened a "Broadcasting House" in a new building on North Fourth Street across from its newspaper plant. An auditorium studio took up much of the ground floor. On other floors were offices, radio control rooms, studios and space reserved for future TV facilities. A large tower anchored to the roof was sturdy enough to support FM and TV antennas. Larus (WRVA) took a different approach. The land on Midlothian Pike was sufficient for any foreseeable expansion. It would have taken the powers of an exceptional clairvoyant to predict that the front lawn would someday be crowded with antennas aimed toward outer space. A self-supporting 500 foot tower, massive enough to support stacked FM and TV antennas was erected. WRVB(FM), now WRVQ/Q94, began broadcasting from the site in 1947. It was expected at the time that TV operations might begin before 1950. It was not to be: WRVA and WRNL were about to become trapped in a second ice age. The agonizing period of waiting did not end when the channel distribution thaw came. Accumulated old business and an overwhelming deluge of new applications swamped the FCC Broadcast Bureau when processing was resumed in 1952. In almost every instance requests for permits exceeded channel availability per city, forcing long-drawn-out hearings to identify the best qualified applicants. The new city by city channel distribution formula reduced Richmond's VHF share from four to two. One former Richmond channel was shifted to the air, leaving only one additional opening. Although five new UHF channels were allocated to the city, it was an untested band shunned by pioneer broadcasters. 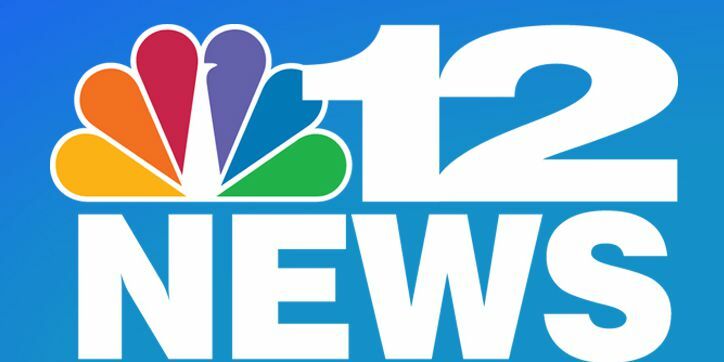 The owners of WRNL and WRVA, along with Neighborhood Theaters, WLEE and Southern Broadcasters, a Winston Salem company, competed for authority to operate a station on VHF Channel 12. The Commission set a date for a comparative hearing to determine the relative merits of applicants. New FCC rules that were part of the reallocation plan allowed stations to build taller towers and operate with more power. Havens quickly applied for a permit to boost the power of WTVR and the height of its antenna to the maximum allowed. While other applicants were struggling with hearings, Havens was building his new plant behind the Broad Street studio. In 1953 WTVR switched to its tall tower. Meanwhile, WRVA management, wise to workings of the Commission's examiners, demonstrated serious commitment in the years before the Richmond case was heard. A two-camera training studio was built in a corner of the Larus tobacco factory. The cost of cameras, lights and other equipment was less than $40,000, compared with many times that amount gambled by some TV hopefuls who sought favorable attention in Washington. A comprehensive training program put future TV personnel through months of news and entertainment dry runs and other matters pertaining to television operations. WRVA was a CBS-Radio affiliate at the time. Employees marked for management positions were sent to CBS-Television for seminars and workshops. The chief engineer-elect attended half a dozen television technical seminars sponsored by RCA. Other technicians spent varying lengths of time at television factories for hands-on equipment exposure. Some stations employed outside engineering consultants to plan and supervise construction of facilities. WRVA traditionally used in-house personnel. The future chief engineer visited stations from Greensboro to New Haven and as west as Cleveland and Detroit to study TV plants already in operation. Having developed basic design notions, he escorted architects to Washington and Philadelphia for their examination of TV stations. Preliminary building plans were developed and presented to top management. The building proposed was a handsome structure that could have been an asset to the community. Estimated construction cost was $1.8 million, a sizable sum in the 1950's. The proposal was summarily rejected as being too expensive. The chief was put down by the senior owner who pointed out that he had a fine dairy barn on his farm that was made of concrete blocks. In his opinion, such a structure was completely adequate for almost any purpose. The future WWBT ended up with a building that reflected the wishes of a man who deeply admired his cow barn. In a strategic move to enhance chances of winning, the owners of WRVA approached Neighborhood Theaters with an offer to merge its application with that of the theater corporation's newly created Richmond Television Corporation (RTVC). Oddly, the theater group allowed Larus to assume 60 percent (controlling) interest. Owners of WLEE, evidently viewing RTVC and WRNL as unbeatable, soon withdrew from the Richmond arena. The company filed for Channel 8 in Petersburg and easily won in a comparative test against the owner of a small radio station in that city. Its WXEX, affiliated with NBC, began broadcasting from Petersburg in mid-1955. Southern Broadcasters withdrew its application. The Midlothian Turnpike property was transferred to Richmond Television Corporation after the marriage of convenience with the theater group. Neighborhood Theaters had close ties with Morton G. Thalhimer, Inc., principally a commercial real estate management and sales corporation. Thalhimer represented owners of large tracts of undeveloped land in western Henrico County. Tension developed between the two. Mr. Thalhimer advanced a proposal to locate the station on several acres of undeveloped West Broad Street land. His reasoning was sound from the perspective of a real estate man: land values in that part of the city and county were appreciating rapidly, the location offered high public visibility, access was good. His stated opinion was that real estate investment futures along Midlothian Pike in Chesterfield County were not bright. Experienced broadcasters who spoke for WRVA argued that real estate considerations were secondary: station location was a matter dictated by FCC and FAA requirements, local ordinances and engineering considerations. Henrico County officials had already expressed their distaste for very tall towers, while rural Chesterfield had shown no such bias. Besides, the corporation's land on Midlothian Turnpike was already cleared by the county government for a tall tower. Thalhimer land would have cost half a million dollars, while the Pike property had been purchased for less than $10,000. Thalhimer lost the round. Trivia: The site proposed by Thalhimer was immediately west of Reynolds Metals' corporate headquarters in the space where Interstate 64 now passes under West Broad Street. At that time little commercial development existed west of Reynolds. Midlothian Turnpike was equally pristine. The decision awarding Richmond Television Corporation a construction permit was announced December 2, 1955, more than ten years after wartime restrictions were lifted. Richmond Newspapers, the big loser, eventually abandoned its million dollar broadcasting center on Fourth Street. The chief engineer for television was promoted and transferred from WRVA Radio to RTVC the day the FCC announced its decision to deny Richmond Newspapers' (WRNL) application. He was the station's first employee. Ground was broken three days later for the market's third TV station. WXEX signed-on in Petersburg four months earlier. The ceremonial act of turning the first earth was distinctly a non-event on a cold afternoon. Tobacco company officials and radio station executives remained at desks in their snug downtown offices. The station's photographer shot a single picture of a lonely trio---a young woman pressing a spade into soft earth as the new chief and a contractor's superintendent looked on. That was it---no hoopla, no speeches. The only public notice of the event was a one paragraph squib in the WRVA news. Local newspapers declined to use the picture. It appeared later in the radio station's monthly newsletter and program guide. Others on the management team transferred from radio on January 2, 1956. They occupied a temporary office on Main Street until April. The staff grew on a timetable that would bring in employees as needed. Technicians were the first to be called. The future technical operations group, directed by two manufacture's engineers, began installing equipment in early March, working more than ten hours a day, six days a week to meet a start-up date set by top management. WRVA-TV was the first large business to locate west of the Atlantic Coast Line (now CSX) railroad tracks in northern Chesterfield County. The station was located in a neighborhood of small farms, modest homes, one pump filling station and two man auto repair shops. The only nearby restaurant was a dingy hamburger and beer joint across Midlothian Turnpike. Factory engineers who assisted during construction had the choice of sleeping on lumpy mattresses at nearby six cabin tourist operation or checking in at a downtown hotel. Midlothian Turnpike had been rebuilt to four lane capacity a year earlier but was still a lightly traveled rural highway. In mid-April a test pattern was seen on Channel 12 for the first time. Regular program service began at 12:15 p.m. on Sunday, April 29 with a brief dedication ceremony conducted by churchmen of the Protestant, Jewish and Catholic faiths. The first fifteen minute news presentation was sent at 7:00 p.m. the next evening. The studio roof had not been completely waterproofed. For two or three days the primitive news set---actually nothing but an office desk---was protected by an overhead canvas tarpaulin to ward off possible dribbles of water. Behind the newsman was a hastily installed gray curtain. The economy roof structure had no sound insulation, an extension of the cow barn philosophy. Sounds of thunder and the drumming of heavy rain hitting the roof would forever mar studio production. Few offices were ready for occupancy. Desks were clustered in areas that had been roofed over. Recognizing that the lack of air conditioning during construction presented a comfort problem, casual dress was permitted. Some young women took full advantage of relaxed rules during warm days of late spring by showing up for work wearing scanty outfits that would have stopped a varsity ball game. One, known for her liberal attitudes, sashayed in one morning wearing a clear plastic top and no bra. Little objection was heard from some quarters. Construction workers, however, freely admitted that it slowed work. She was sent home to change. Younger employees were not immune to their relaxed surroundings that glorious spring. An informal patrol was kept busy shooing people out of dark corners. Four cameras were included in the first equipment order, two for studio and two for field service. None could be described as "portable"; each chain, comprising camera head, tripod, control unit, monitor, connecting cables and power supply, weighed about 1000 pounds. Truly portable microwave equipment was not available in 1956. In most cities the telephone company provided TV connections between field locations and station control rooms. The first remote pickup was scheduled in October when Willow Lawn Shopping Center, the first mall in Richmond, opened for business. A thirty minute ceremony was broadcast live in late afternoon. Lacking a truck and microwave equipment, the Technical Department rented a large van in which was placed a crude table made of thick boards laid on saw horses. Equipment transported to Willow Lawn weighed more than a ton--all for a two camera job. The telephone company lacked coaxial cables and microwave facilities needed to send TV signals across town. Terminal and microwave units were rented from C&P-Washington for the job. Willow Lawn lies in a depression where a direct microwave shot to the telephone company building or directly to Channel 12 was not feasible at the time. C&P technicians laid temporary cable on the ground from Willow Lawn to Staples Mill Road, two blocks away. From there the program was sent by microwave to C&P headquarters at 8th and Grace Streets, thence over a CBS backup microwave circuit to WRVA-TV. Willow Lawn executives were thrilled, station management pleased and technicians pooped. It was a long day. A medium size van, purchased in a few months, was used to transport field equipment. Costly C&P local service was dropped after portable microwave transmitters and receivers were introduced in 1958. Crews went to football, baseball and basketball games, golf and tennis matches, political events, auto races, the State Fair, nighttime Tobacco Festival Parades, the Richmond Symphony at the Mosque, governors inaugurations at the State Capitol and into department stores and auto dealerships. Programs were live events--RCA and Ampex were still in a race to perfect and market something they called a video recorder. "Videotape" was a word yet to be coined. WRVA-TV was quickly recognized as the city's leading remote broadcaster. WTVR did not schedule out-of-studio programs for years. A WXEX truck was seen only when something big was to be covered. WRVA-TV and successor WWBT have maintained the lead for 33 years. Early television broadcasting was highly labor intensive. Few machines existed that could assist salespersons, creative artists, news people, anybody. Human hands and brains were needed all along the way to produce and deliver the product to viewers. Organizing a staff starting from ground zero at new television stations was a difficult and trying experience. Managers and department heads, often making vertical transfers from parent radio companies, may have known radio, but television presented new challenges. People having extensive TV experience were spread thinly among the several hundred stations that were on the air by the mid-1950's. Personnel needed to fill job openings at new stations came from parent radio broadcasting companies, other TV stations and a variety of TV oriented schools. At WRVA-TV the mix was about equally divided among WRVA transferees, those from other TV stations and TV schools, and those who lacked any previous broadcast experience. Anguish sometimes chilled the excitement of moving out of radio to TV. The first news anchor relinquished his job as senior newsman at WRVA where he had a loyal following that outnumbered the combined news tune-in of all other Richmond radio stations. He was expected to be a real powerhouse. The man was great on radio--on TV he failed to come across. Ratings remained flat for a year as he tried desperately to find a fix. The poor man had worked for WRVA more than 10 years, built a home, had children in school and a wife who teaching in the school system. A painful decision was forced on his longtime colleagues--he had to go if the station had hoped to build a news audience. There was no turning back. The vacancy at WRVA had been filled by another popular newscaster. He was the first person at WRVA-TV to feel the cold steel blade of the ratings ax. The president divided his time between WRVA and the new TV station. He was known to be a man who expected everyone to carry his fair share of the work load. He had little patience with loafers and was quick to make his displeasure known. The old gentleman made a practice of opening seldom used doors and peering into dark corners. In the photo lab was a tiny closet where one went to load film holders for still-cameras. (Yes, early TV made wide use of stills for news and commercials.) On an unexpected early morning visit to the station Mister CT, as close associates called him, found an employee in the closet reading a morning paper, all the while ignoring persistent intercom page. The hapless idler lasted long enough to pick up his final check. Although he was not penalized for dereliction, a news cameraman caused the station to miss breaking the flash locally when President Kennedy was shot. He was alone in the news office, feet on desk, reading a newspaper, all the while ignoring a teletype bell that had clanged without pause. A junior employee rushed in to see what the frantic ringing was about. He literally screamed at the cameraman that the President had been shot. The laggard, suspecting a ruse, never lifted his eyes from his paper. The network cut in with the most dramatic news flash in the history of television before an announcer could be summoned. Three valuable minutes and a local first had been lost. Another employee, a projectionist, was discharged after repeatedly being called on the carpet for careless job performance. patience of his co-workers and management ended one night when a director was surprised to see a reel holding the late-night movie rolling across the floor. The operator had failed to snap a reel-lock on the projector. When confronted the next day, his response was, "Frankly, I don't give a damn." Termination was quickly arranged. Some termination's were even faster. Another incident...another projectionist and a cop. A man in blue strode through the station, arrested the film jockey and took him away. His unattended machine continued to roll. The ex-jock served nine years. Burglary rap. For about a year network video was delivered to the station via microwave, but audio came in on a special line that was incorporated in the regular telephone cable, which in those days was suspended on poles beside the Pike. A temporary overhead wire completed the connection between the streetside cable and master control. Arrangements were made to land an Army helicopter on the front lawn in connection with a military recruiting drive. A morning soap was in progress when audio was interrupted. A hasty call to the telephone company brought assurances that sound was leaving the downtown office okay. The thin overhead wire, unnoticed by the chopper pilot, had been neatly severed. A resourceful film cameraman quickly grasped broken strands and held ends together until an emergency splice could be made. Fidel Castro's Cuba confiscated a WRVA-TV movie camera shortly before the Bay of Pigs affair. An adventurer convinced the news director that he could smuggle some terrific footage out of Cuba. All he needed, he said, was the loan of a camera. The story, according to him, would be a dynamite exclusive. A movie camera and supply of film was turned over to the swashbuckler who headed for Florida and a blockade runner's boat. Weeks passed without contact. In fact, he was never again heard from directly. It was eventually learned through clandestine sources that the freelance news hawk had been captured and sentenced to a term in Havana's forbidding jail. The camera was never recovered. Bottom dollar backyard swimming pools were hot items in the early 1060s. For $950 a supplier dug a hole in a residential backyard, lined it with cinder blocks and dropped in a heavy-duty vinyl liner. Voila, in three days a water-filled hole in the back yard became a yuppie family's newest plaything. A distributor opened a shop on Forest Hill Avenue. He was soon pounced on by a Channel 12 salesman eager to sell something--sell anything. The undercapitalized vendor, having misjudged the market, and struggling to keep his head above water, suggested a trade. He would install a demonstration pool on station property in exchange for air time. Agreed. The pool won immediate favor among the office staff and created a big headache for managers. Counting time to get out of bathing attire, dress, fix hair, put on lipstick or whatever, office routine was interrupted until two o'clock. At 1 p.m. curfew had to be introduced. The evening studio crew may have had the most fun. The pool worked fine for a few weeks. One morning it was found half empty. It looked as if a cookie cutter had been used to cut several holes in the vinyl. The dealer was puzzled, but went ahead and made free repairs anyway. The truth leaked out in a few days; the evening crew was using the pool area after news sign-off for beer busts. A trainee studio cameraman named "Woozy" pole vaulted across the pool several times, using the long steel tube that was part of the pool cleaning kit. It was a neat cookie cutter. "Woozy" reaffirmed the reason for his sobriquet. He was also chewed out. The vendor was out of business before another summer arrived. TV employees have enjoyed his pool for thirty years, although with more restraint. RTVC spent several thousand dollars to reinforce walls with steel rods and smooth-coat the rough cement blocks in order to prolong the life of a $950 hole in the ground. The swimming pool still earns its keep. In the early years teenagers came to the station by invitation once a week for a poolside dance party sponsored by Miller and Rhoads. Young people modeled swim wear and all the trappings of beach life. Women, now fiftyish, still ask about the emcee who was billed The Teen Age Rage. Marine dealers launched boats in the pool, demonstrated outboard motors, fishing gear and water sports goods. For years starting swimmers were taught the basics in supervised classes by YWCA instructors. Probably the most novel commercial that featured the pool was sponsored by Streitmann Biscuits. A watertight package was being promoted at the time. Two police department frogmen were hired to dive in and retrieve several big James River carp that had been released in the water. The gimmick was that one frogman would snare a box of Streitmann biscuits instead of a carp, then both swimmers would sit on pool edge, open the package and taste a few crackers to demonstrate their freshness. The act wasn't convincing. It aired only a few times. For years professional football rules did not allow TV carriage in the city of origination. Redskins fans drove to Richmond on Washington blackout days, rented motel rooms, hauled in cases of beer and settled down to watch the screen. One Sunday network chieftains, for a reason now forgotten, decided to switch games at the last minute. The station's night door rattled under great pounding less than 30 minutes into the substitute tournament. Standing outside was a beer sloshed crowd of Washingtonians who announced that the engineer's face was about to be rearranged and the building dismantled brick by brick. Ordinary door glass was replaced by wire reinforced lexan and the lock quickly beefed up as a result of the incident. Sports events are broadcast to conclusion. Right? Well, it wasn't always so. For a long time the ninth inning or the fourth quarter was clipped if the game infringed on prime time and to heck with the final play. Heidi--nice little Heidi and her beloved grandfather--changed long standing network practice. With less than 4 minutes of play remaining, it was the Oakland Raiders over the NY Jets by a wide margin. Football that afternoon in late 1968 was lackluster; even the great Joe Namath seemed unable to get going. NBC decision makers in New York decided to pull the plug on schedule and run Heidi as advertised. A flurry of phone calls from angry fans quickly swamped the WWBT weekend answering service. Frustrated viewers switched over to radio to catch the conclusion of the game. As Boom Boom would say: Boom, boom, boom, the Jets rallied and in quick succession made three touchdowns, once again bringing glory to the Big Apple. NBC--and WWBT in the minds of local viewers--blew it. Calls to the station quickly increased from flurries to an avalanche. In minutes the telephone company's 233 exchange overloaded, paralyzing the system for all users and effectively isolating the station from the outside world. Viewer reaction in New York and at affiliated stations across the country was similar. And that, gentle reader, is why sports events are aired to conclusion, thus delaying programs for the rest of the evening. An unlisted special connection from Master Control to the 644 exchange across town was ordered the next day. It would serve as a bypass should callers ever again paralyze the listed 233 number. The number was phased out in 1989 when part of the station's PBX was connected to the 230 exchange. A neo-Nazi raised the blood pressure of conservative Virginians when he ran for president, backed by a soon forgotten minor party. Trapped in a Fairness Doctrine thicket, station officials had no choice but to honor a request for air time. Several protesters and supporters gathered in front of the building before he arrived. Actually, the man had a pleasant disposition, spoke softly before the camera and raised no issues not heard before. But the broadcast had barely started when the switchboard was flooded with calls from angry viewers. Meanwhile, the outdoor crowd was growing and becoming unruly. A squad of policemen cleared the area. A daily program for preschoolers was imaginative. Miss Nancy lined up creative projects, planned entertaining games, provided animals to pet, pictures to paint, sand castles to be built. When a small-animal circus came to Southside Plaza, arrangements were made to bring a baby elephant into the studio. Five-year-old youngsters had a great time feeling its trunk, giving the elephant peanuts and taking turns sitting on its back. Miss Nancy had a grand idea: "let's have a parade, with the elephant leading the procession." On the second lap around the studio, the pachyderm did and did what pachyderms do and do. Green fumes made some kids ill. Hit black, roll film, get out the Air Wick, open the door, do something. It was autumn, leaves approaching peak color--a season when skies are clear and nights crisp; a time to have a Fall Fling under a full moon. Departing from the custom of serving catered food, the Fling Committee decided to have a poolside party featuring an old fashioned down-on-the- farm hog roast. Now, a country barbecue party is not your ordinary backyard cookout. The carcass of a whole hog is roasted above ground, fueled by green saplings in the charcoal source. Hot embers by the shovelful are transferred frequently from bonfire to cooking pit. It's no jiffy process; count on at least eighteen hours to thoroughly cook a large porker. The carcass, secured fore and aft on a homemade iron grill, must be turned frequently to maintain uniform temperature. There's much basting, using highly seasoned "secret" sauces--an all night and next day ritual of turning, basting, replenishing charcoal. Dawn on festival day was misty and cool. Overnight volunteers retired to get a little sleep while newcomers continued the ritual. Mist had turned to light rain by ten o'clock and cooks huddled under a lawn tent in an attempt to avoid being soaked. One of the party, feeling that his cohorts deserved a special treat to compensate for discomfort, went home and prepared a picnic jug brimful of hot buttered rum, the main ingredient being 151 proof Meyers. Alfresco feasting and merrymaking was scheduled to begin late in the day, but falling temperature and intermittent showers forced activities indoors. Hungry staffers, unaware that the pit crew had quaffed a hefty ration of hot grog, enjoyed generously seasoned roasted pork washed down with cold beer, all the while wondering why cooks rather than the barbecue appeared to be more saturated with "sauce." An after dinner sing-along helped return the party into a rousing success. Occasionally, a company-sponsored social event did not turn out well. The program committee had meager funds to finance a party dinner the first Christmas in 1956. The best place to be had, considering the fiscal matter, was a cheap roadhouse far out in Chesterfield County in the Hull Street boonies. Employees were still more or less strangers and little camaraderie had developed. It was hoped that this first social gathering would help create a more friendly spirit at work. A cash bar was available. Most people ordered a token drink, but one man, a West Virginian mountain man, got skunk drunk on moonshine he brought in his personal bottle. The meal was ruined when he picked a fight with one of his colleagues, bloodied his nose and ripped the shirt from his back. It put a damper on station socials for a time. In a better year the Christmas party featured "The Continentals," a local carryover from the big band era. Music was sweet and the program included dance tunes from current pop to ballroom standards, something to appeal to the varied tastes of the young to the middle-aged who were present that evening. All seemed to have a good time, but, as every entertainment committee knows, you can't please 'em all. There were loud complaints in the hall the next day about "that crummy, creepy music." The voices were those of the youngest partygoers, of course. When WRVA-TV signed-on in 1956 owners and management had every reason to expect it to take off like a rocket boosted by momentum of its radio predecessor. Employees who transferred from highly successful WRVA worked alongside newly hired personnel who came from other TV stations and, in one case, from CBS-NY. Department heads had gone to network sponsored seminars structured to address management and program aspects of the emerging TV broadcasting Business. The station was a CBS affiliate. Program plans, quickly implemented, called for active community involvement. Technical equipment was the best available. A loyal WRVA radio audience was expected to quickly embrace and nurture the infant television station. It was known there would be obstacles. The station would be competing with one that had been in operation for eight years; outdoor receiving antennas, often a necessity at the time, were aimed toward the older station; viewers were unaccustomed to dial switching; the new Channel 8 outlet in Petersburg was expected to siphon off viewers south of Richmond; advertisers wanted a proven audience base. Frequent telephone surveys made during after-dinner hours by a national ratings firm showed that relatively few viewers were switching to WRVA-TV. The 1956 autumn sweep was disappointing, although not alarmingly below projections for the first months of operation. Local programs and station promotion went through a period of readjustment during the winter. The station remained in third place in the spring rating books. Twelve months before the first term of the affiliation contract was due to expire, CBS gave protective notice of cancellation, with a proviso that the agreement would continue if ratings showed marked improvement. Local programs were substantially improved, principally by purchasing better feature movies and syndicated shows. Promotion was stepped up through increased use of billboards and frequent full page ads in Richmond and out of town newspapers. Service shops and stores that sold TV sets were given incentives to promotes sales of rotatable home antennas. Tours through the station were conducted on Sunday afternoons to give the public an opportunity to see how a television station works. Although of lesser immediate promotional value, tours for school groups of all ages were conducted for several years. Moderate improvement in audience numbers after a year failed to save the network connection. WTVR, left with ABC after losing CBS and NBC to WRVA-TV and WXEX respectively, was still the most looked-at station. CBS moved its affiliation to Channel 6, leaving WRVA-TV with no place to go but ABC, then a struggling third network which in the late 1950's was regarded on Madison Avenue as unlikely to survive. Channel 12 switched to ABC on May 30, 1960. Well intentioned company policy may have been the major contributor to slow audience growth. The station was burdened with the impractical objective of covering all of central Virginia with a strong signal. The antenna was designed to keep a certain percentage of radiated energy above ground for the first twenty or thirty miles from the tower, wasting signal over sparsely populated areas at the cost of reduced strength in the city and adjoining counties. A side effect of design was uneven local coverage. At some locations in the city pictures were weak and snowy. Mail that reported occasional freak reception of the station in distant places, especially eastern Pennsylvania, New York City and on both sides of Long Island Sound, may have been an indication that part of the signal was overshooting the desired target area. Mechanical and electrical changes in the antenna, made in 1960, somewhat improved reception in the city. Thalhimer, becoming increasingly critical of performance after CBS was lost, applied pressure to get the station into high gear. In exasperation, Larus offered to purchase stock certificates from dissidents. All outstanding theater and most minority shares were tendered and purchased. Larus and Brother Tobacco Company became 97-percent owner of Richmond Television Corporation. The ABC connection brought new problems. Network service began in midmorning and ended at 11 p.m., leaving affiliates with hours of time to be filled locally. For several months sign-on was delayed until nine o'clock, and sign-off came at conclusion of the late news. The development of in-house talent and imaginative promotion turned business around in the early 1960's. Two Ampex videotape machines came on line in 1959 and 1960 respectively, giving WRVA-TV the distinction of being the first station in the state and among the first nationwide to be so equipped. Networks bought the first 25 machines. The Richmond machine was about the tenth delivered to non-network customers. The VTR's were responsible for a dramatic improvement in local sales, particularly in automobiles and durable goods. It was an era of driving cars into the studio for taping sessions, and the scene dock was always jammed with furniture and white goods waiting for studio time. Off premises commercial production was less successful. Although TV crews went to auto sales lots and department stores, heavy cameras and bulky cable connections to the remote truck made the venture impracticable. Ratings were so improved by 1964, mostly at the expense of WXEX, that management decided to seek NBC affiliation. It was a difficult decision to make, however, for ABC by then was attracting attention nationally and looking better all the while. The game of musical chairs played its last tune in 1965. 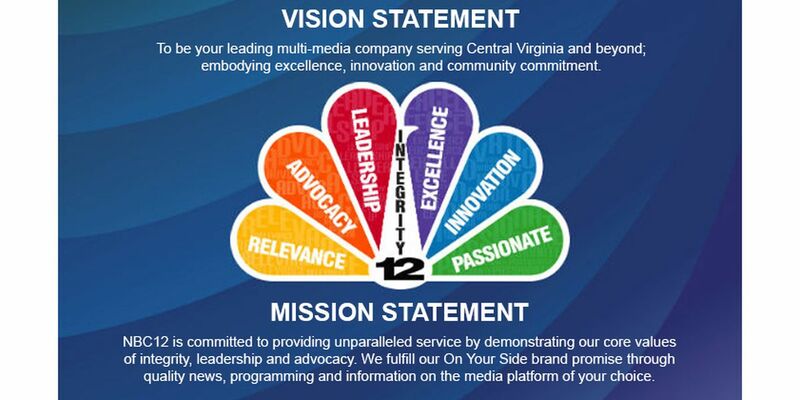 WRVA-TV became an NBC station. Over a span of less than ten years it had been connected to every network. Weather reporters locally and on the networks in the 1950's and 60's ranged from awful to passable. Means to collect data was almost nonexistent. Presentation techniques were primitive; some broadcasters preferred permanent maps produced in the art department and others got by with daily hand drawn charts interpreted with much finger pointing and arm waving. Others depended on metallic map boards on which magnetic symbols were pressed; wands or chalk were de riguer in some studios; some weather people were serious, others comics. WRVA-TV tried them all. Network figures may have had some degree of professional expertise, but at the local level sunny/rainy day gurus usually had other primary job functions--weather was a sideline. Lacking the availability of satellites and radar, data presented on the air was the same precooked information distributed by the government weather service. Herbert "Herb" Clarke spoke from both sides of his head for a time. He wore the dual hats of sports and weather reporter until the posts were separated when Atlantic Refining Company picked up weather sponsorship. After that, bowing to wishes of the client, Herb delivered his daily summary attired in a regulation filling station employee's uniform complete with visored cap and black leather bow tie, and surrounded by tires, quarts of oil and other Atlantic products. "Your Atlantic Weather Reporter" was believable and popular. Viewers came to depend on his daily predictions for rain, snow, hot and cold. But a bigger city called. Herb picked up the weather job at WCAU in Philadelphia. Newspapers in that city call him "Philadelphia's Mr. Weather Man" in the position he has occupied at WCAU for more than twenty-five years. One of the station's most popular personalities occasionally reported weather as a secondary assignment. His primary job was host for daily cartoon and science programs aimed toward seven to twelve year-olds. Sailor Bob was a skilled cartoonist who embellished his cloud charts with assorted characters that displayed smiling or sad faces depending on conditions outdoors. No suitable weather seer was on the staff around the time of transition to WWBT management. The task was handled temporarily by the news director who, on camera, was a buffoon, a Cousin Willard without a Gumblian side kick. His approach to reporting weather was light, and in the opinion of his critics, terrible. Hand drawn situation maps were cluttered with elementary cartoons and stick men. His creative noun twists must have made professional meteorologists cringe. Mixed snow and rain became "s'rain", sleet and rain was "sl'ain," snow mixed with sleet came out as "sn'eet." Honest--that was Channel 12's weather format for a mercifully short time. Spencer Christian, a native of Charles City County, was just out of Army service when he was hired by WWBT. Although a professional journalist, being the newest kid on the roster made him vulnerable for the weather draft. He demurred, but the manager, having run out of ideas to top sn'eet and sn'ail, insisted. The rest is history. Christian stayed with WWBT briefly before moving on to Baltimore, then to ABC, New York, where he became the net's popular morning weather oracle. The weather beat was a springboard for a young meteorologist. Jeff Lawson deserted Richmond for a larger market when he moved to the weather berth at WTTG, Washington. Other station people were drawn by West Coast glitter. Chuck Shull, one of the first WRVA-TV news anchors, eventually pulled up stakes and headed west with wife Jennifer. Chuck was the face and voice that sold Tetley Tea for years. Jennifer became a Hollywood script writer. Anna Inge, tired of office routine at WRVA-TV, moved to Hollywood writing departments. Anna caught the eye of Gordon Jump--they were married in the lean years before Gordon became the bumbling General Manager of "WKRP in Cincinnati." William T. Reed, Jr., Chairman of the Board of Larus and Brother Company, Inc. and its Richmond Television Corporation subsidiary, died suddenly in 1966, leaving no likely successor to guide the companies. The tobacco products concern, founded in 1876, passed from generation to generation as a family legacy. Reed's death came at a time when the cigarette and smoking tobacco industry was declining, radio income down, and the company's future in television uncertain. More than one hundred heirs among the Larus and Reed family dynasties have business connections other than manufacturing and broadcasting. Stockholders (the families) made a quiet decision to dispose of tobacco, radio and TV holdings. The agreement was a carefully guarded secret until the owners were ready to disclose their intentions. Announcement of the coming breakup of one of the city's oldest companies shocked business and public sectors alike. Products of the factory, especially its Edgeworth pipe tobacco, were marketed nationwide. Larus founded widely known WRVA in 1925. Power of the clear-channel station was increased in 1939 to 50,000 watts--ten times greater than any other broadcaster in the state. Its clear channel cut a swath through the airwaves from Bermuda to Chicago and beyond. Latecomer WRVA-TV by then had earned a position of prominence among area broadcasters, and pushed WXEX into third place and was crowding WTVR for top ratings. In a move toward spinning off tobacco and broadcasting divisions separately the parent corporation was converted to a holding company. Tobacco, WRVA-Radio, Inc. And WRVB-FM, Inc. became separate entities. No change was made in the structure of Richmond Television Corporation since it was already a separate corporation. A broker who specialized in selling radio and TV stations was engaged. Disposal of assets was not a distress sale; the owners, known for a long history of civic involvement in many fields, reserved the right to be selective, with the aim of selling its stations only to broadcasters known to have exemplary records of community service elsewhere. Negotiations with Jefferson Standard Broadcasting Company (now Jefferson-Pilot Communications) began after another prominent southeastern multi-station operator failed to pass scrutiny. Charles H. Crutchfield, president of the North Carolina company, was met at the airport by his Richmond counterpart. The desire to keep negotiations secret was so strong that Mr. Crutchfield was denied entry to the building. The Richmond president explained to his guest that knowledge of his presence might start a wave of premature speculation. Mr. Crutchfield returned home without seeing more than the balance sheet, the grounds, a tower and a swimming pool. But he had made up his mind; purchase was recommended contingent on further investigation by his company. How could he be wrong? The asking price was right, with no inherited debt. Jefferson Standard would probably have been interested in WRVA Radio, too, had FCC rules permitted common ownership of two overlapping 50 kilowatt stations. Jefferson's WBT-Charlotte radiates its most powerful signal on a north-south axis, while WRVA beams maximum power east to west. The pair could have blanketed a sizable portion of the eastern and midwestern states, which would have been undesirable for economic and policy reasons in the eyes of several government agencies. A Charlotte delegation that visited the station on May 16, 1968, was the first to be invited indoors. The inspection team must have been appalled by what they saw--an austere lobby, offices with unadorned walls painted in two shades of green, and floors that were an unbroken expanse of plain white vinyl, all of which combined to create an institutional atmosphere. Two strictly utilitarian studios had unpainted walls and bare concrete floors. Except for new General Electric color cameras, a GE color film chain and two Ampex tape machines modified for color, technical equipment had reached its terminal life if judged by industry practice. The development of broadcasting hardware never stood still; the 12 year-old transmitter and control room equipment represented a technology nearing obsolescence. The inspection team recommended purchase. Staying with the WRVA-TV call letters might have had promotional value, but FCC rules do not allow shared calls if radio and TV stations are not under common ownership. A request to change the station ID to "WWBT" was included in the license transfer application. Commission approval was granted in mid-November, 1968. All remaining details of the sale were completed by November 27. 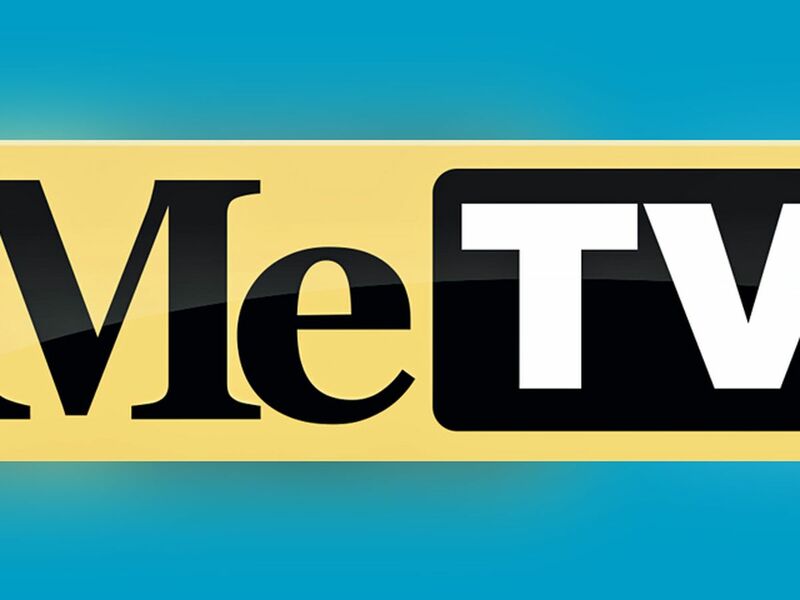 Although viewers may not necessarily have been aware that the station had a new owner, visible changes came hours after the transfer contract was signed. WRVA-TV closed down at 1:00 a.m. on November 28, 1968. An hour earlier a construction crane pulled in front of the building and parked. Workmen spent the hours of darkness changing big stainless steel letters on the front wall. Motorists on Midlothian Turnpike were surprised at dawn when they saw the proud new WWBT logo. It was Thanksgiving morning. The sign-on crew loaded a new ID slide. WWBT was officially in business. Thanksgiving Day, 1968: WWBT Wakes Up Richmond With Its New ID and Fresh Television Ideas The Jefferson Standard influence raced through every department. An engineering consulting firm took to the field to measure signal strength in every direction out to 55 miles from the tower, the chief engineer was asked to name specific items of equipment that he considered needed immediate replacement, the sales department was quickly overhauled. News department personnel, long squeezed into cramped quarters, saw a partition knocked out and working space doubled. More reporters and photographers were on the street in a few weeks. Carpets and vinyl wall covering bought a fresh, new look to offices and corridors, and the lobby was brightened with new furniture. A new studio video switcher and improved audio equipment came on line. The engineering consultant, after studying data gathered during his signal strength survey, recommended changes in the antenna that would improve reception in the city and neighboring counties. A color film chain from RCA and studio cameras from Norleco replaced the GE equipment. An order was placed with RCA for the newest state of the art transmitter--and construction was started on an addition to the building that would house the new apparatus. The transmitter and an improved master control switcher were activated in 1970. A modest step toward automation made it possible for one person to watch the transmitter and execute master switching. Another technician working in the old operations room attended to loading film projectors and videotape machines. Billboards reminded motorists on every major traffic artery that The Scene Tonight would appear on home screens at 6 and 11. Names of anchors, sports and weather personalities became household words. Public awareness of the station was constantly refreshed by such activities as blood give-ins, all-night fund raising campaigns for national health programs and a massive "Letters to Hanoi" drive intended to remind Vietnam that America wanted her sons back. Thousands of letters collected by WBTV and WWBT were personally delivered to a neutral intermediary in Stockholm, Sweden, by representatives of the two Jefferson Standard stations. In the early 1970's the news department moved to larger quarters. The former transmitter room was stripped to bare walls and reconfigured to house videotape machines, film projectors and a new studio control room. The first computer terminal--located in Sales--tied in with Jefferson Data Services mainframe in Charlotte. Later the same year a computer was used for the first time to facilitate the analysis of state election returns. To supplement film for news gathering a smaller, lighter weight video camera was purchased in 1975. A portable transmitter, paired with new receiving equipment at the station, made possible more economical coverage of special events. For the first time, late breaking news could be picked up live and transmitted directly to master control. Video tape recorded on location or relayed via microwave to a news department VTR could be edited almost to air time, saving hours formerly lost while motion picture film passed through developing tanks. Further miniaturization of video equipment extended the ability of reporters to cover news happenings more effectively than hitherto possible. The two-piece camera and video recorder fell into disuse after now ubiquitous camcorders were introduced. Cramped workspace was a recurring problem. News moved again in 1978 to larger quarters in a new addition to the building, and the sales department settled into its newly constructed suite. WWBT looked toward the sky in 1981 when the first satellite receiving antenna was installed on the front lawn. It opened the way to program opportunities never available before. Weather came of age at WWBT in the 1980's. Chalk boards and comic weather reporters by then had passed into folk history. Professional staff meteorologists, backed up with such tools as Doppler radar, satellite views of clouds in motion, resources of NOAA, the National Weather Service and private weather forecasters, explain to Channel 12 viewers what to expect from lows, highs and fronts. Graphic arts specialists cleaned their inky-messy tools for the last time and turned to electronic ways to create superior artwork. Motion picture film became a relic of television's past. The processor was dismantled for electronic graphics. Film projectors followed processing equipment to the surplus dealer. Personal computers for word processing and other forms of business automation replaced typewriters. Television transmitters have a practical life of only fifteen to twenty years due to never ending product improvement. By 1985 the unit installed by Jefferson-Pilot in 1970 was becoming an antique. To avoid disrupting operations during replacement, a second story was added above the old equipment room to house a new transmitter, much of it consisting of electronic devices not even dreamed of by scientists when television broadcasting began its rapid expansion into almost every corner of the nation in the 1950's. First generation technical equipment, with the exception of the tower and main antenna, was completely phased out during the 1970's. The antenna, a design developed soon after World War II, was replaced by a newly available helical, circularly polarized model in 1986. The top-of-the-line RCA product delivers a better signal to viewers, whether intercepted by elaborate outdoor home aerials, table top vee [rabbit ear] antennas or simple telescoping rods built into receivers. More power is directed into the city without reducing the energy needed to send a strong signal to outlying communities. The improved quality of reception is often dramatic in locations where WWBT was formerly a poor performer. The time worn news set was replaced by a professionally designed and produced product that brought dazzling freshness to the studio and to viewers. First generation satellite antennas, commonly referred to as dishes, were more than 30 feet in diameter. Later designs brought the size down to manageable dimensions. In 1987 WWBT took to the road with a truck-mounted uplink dish that an operator vehicle arrives on site. LiveStar 12 specials in 1989 included programs from Chesapeake Bay fishing villages, North Carolina beaches, mountain ski resorts and distant college basketball courts, all beyond the economical reach of costly overland microwave links. The station's internal telephone system (PBX) was replaced in late 1988 with a fully automatic facility that included a mysterious "PhoneMail" electronic file cabinet where inter-office or incoming voice messages are digitally stored for later retrieval when the addressee is away from his or her work place. Also, viewer's choice--yes or no, for or against--on a selected sub, , , j,, ,, ect may be polled and stored automatically in PhoneMail where accumulated votes are held until extracted by an attendant. 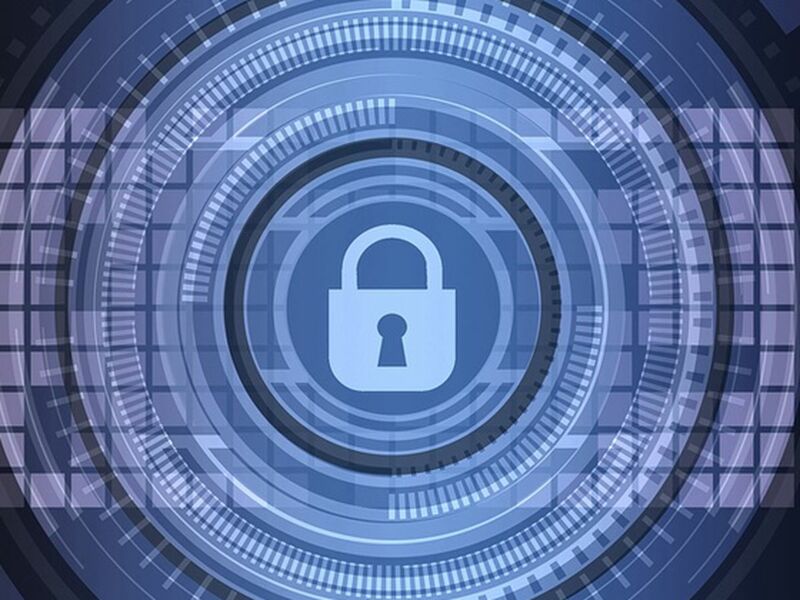 Although it is not part of the Phone Mail system, frequently updated information covering a wide variety of subjects of popular interest may be accessed by persons who dial special four-digit codes associated with a similar type storage device at another location. Known as the Talking Yellow Pages, it is a service of the Donnelly Directory, which features a tie-in with WWBT. Donnelly's 1989-90 directory lists the special codes, starting on the flip side of the front cover. An ombudsman service known as "Call 12...On Your Side" provides advice or help for viewers who have difficulty coping with the maze of red tape that seems to entangle every human transaction these days. In the 1980's most commercial production moved to the field or outside production houses, eliminating the need for cumbersome studio props on the premises at WWBT. Surplus storage space was allocated to technical operations where, in early 1990, an operations center incorporating advanced technology broadcasting hardware is scheduled to come on line. Numerous additions to the building over a span of thirty years doubled usable floor space, but expansion was always in areas that left the main entrance unaltered. A porte-cochere was added in 1989, improving an otherwise bland streetside view. The modernization project includes an enlarged and redecorated lobby. Viewers get a steeplejack's glimpse of the city from a camera permanently mounted high on the main tower. On clear days the downtown skyline is displayed with clarity expected of a fine photograph. At dawn the camera, peering across ground hugging early morning fog, portrays central Richmond as a Babylon poking its minarets upward through a Chaldean mist. Some days the camera is aimed toward a red sunrise, a rosy sunset, wind torn storm clouds, autos bunched at traffic signals on Midlothian Turnpike, vehicles rushing along Chippenham Parkway--SkyCam sees all. A satellite service called LiveStar 12 is used regularly to send news and special event pickups back to WWBT. A helicopter identified as Sky 12 is readily available to transport crews to newsworthy locations. If aerial pictures are desired, a camera and hand held transmitter may be used to send pictures and voice from the 'copter to the station or, when necessary, relayed via the satellite uplink truck and LiverStar 12. Events in Washington in connection with the inauguration of President Bush in January, 1989, gave WWBT news and engineering personnel an opportunity to demonstrate the versatility of their latest electronic news gathering equipment. Coverage viewers using all-WWBT talent and equipment and sent to WWBT by way of the station's satellite truck and LiveStar 12. June 21, 1989, was a busy day, although not unique. News and special events coverage included appearances of President Bush at two locations in Richmond, a striking coal miner's demonstration at the State Capitol, live news reports from Petersburg and Charlottesville, coverage of a rural fair at Crewe, Virginia; also, WWBT cameras were at the site of a coal mine strike in southwestern Virginia and a convention at Fair Grounds where 10,000 recreational vehicle owners shopped for new "rigs" that were plastered with stickers indicating prices up to $500,000. Each, that is. WWBT provided the most comprehensive television coverage in the history of Virginia gubernatorial elections on November 7, 1989. Six continuous hours of live reports, aided by computer tabulation, gave viewers up-to-the-minute reports as precinct counts flowed in. Logistics were staggering: Six live remote sites in Richmond and at key locations in the State, 17 remote cameras, the use of LiveStar 12 and voluntary help of virtually the entire staff of 100 loyal employees accomplished the task without a hitch. Owning to unprecedented interest in the Virginia race, WWBT fed the full six hour special report to WNVT in Northern Virginia and to all the United States via C-Span. Retired President Charles Crutchfield must smile when he hears reports of happenings at the Richmond station twenty years after he recommended its purchase. At least he can count on not being turned away at the front door as he was on a day in the distant past. About the Author: Sanford T. TerrySandy Terry retired from WWBT is 1978. His accomplishments and contributions to the station were many. During his 45 years in broadcasting, he spent 23 years with WRVA Radio where he was Technical Development and Research Manager. During these years, he directed the technical planning and supervised the installation of two FM stations including WRVQ/Q-94. Soon after completing these plans, he began research into the construction and equipping of our television station. The day the FCC granted the, construction permit for WRVA-TV, Sandy was promoted to Chief Engineer. He then supervised the installation of the technical facilities during the construction phase, and managed the technical operations until he retired in 1978. WRVA-TV was purchased by Jefferson-Pilot Communication (then Jefferson Standard Broadcasting) in 1968 when the call letters were changed to WWBT. During World War II, Sandy Terry served in the Pacific on General Douglas MacArthur’s headquarters staff and was away from the station for nearly four years. While in the Army, he planned and directed the construction of a 10,000 watt broadcast station in the U.S.Army Transport Apache. It is thought to be the world’s first completely equipped radio broadcast ship. It had a studio, control room, transmitter and power generating equipment. The ship was first used to broadcast live back to the United States news of the invasion of the Philippines when MacArthur's forces liberated the islands from the Japanese. This would have been known as the first ENG ship! Who else is better qualified to put together a History of our Television Station. Sandy Terry was there from its inception and served our station for over two decades.